This week’s episode features the following segments: Yarn Lover at Large, Double Happiness, and The Front Porch. On Saturday, I took a class with Tricia Weatherston. The class, held at my LYS, Mountain Knits & Pearls in East Stroudsburg, was devoted to the concept of swing knitting. The technique was named and developed by Heidi Liegmann, who offers a series of workshops to help knitters learn the methods and make a variety of projects. Swing knitting is distinguished by numerous segments of German short rows, made using the double stitch, as opposed to the typical “wraps and turns” method. While Liegmann uses musical vocabulary (stanza and melody) to describe the technique, our class at MKP used a pattern by Brigitte Elliot, who employs agricultural terminology (field and furrow) and a much less wordy, more technical set of instructions. 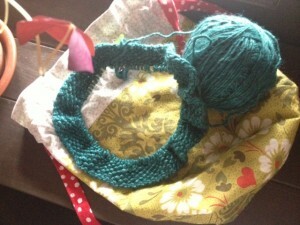 If you’re interested in swing knitting — beware! You must be able to clear your life of distractions in order to work on these patterns. They are not difficult, but they do require your full attention. There’s nothing like the pleasure of starting a new braid of fiber on my wheel. 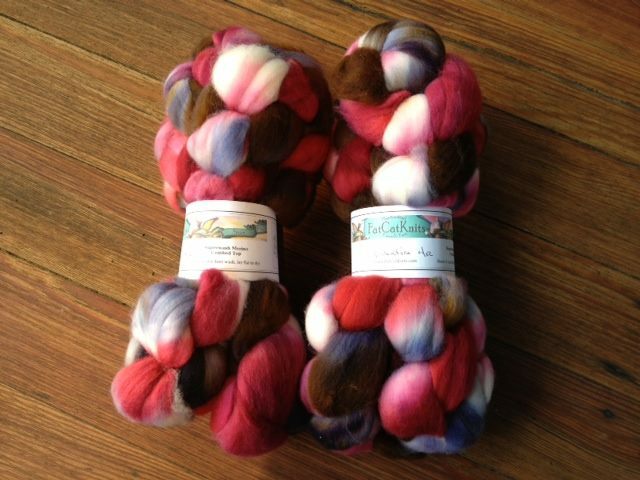 This week, I’m fortunate to begin the gift of some fiber from Fat Cat Knits in the Valentino color way. This is PERFECT for the season — bright pops of pink and other candy colors, balanced by a luscious chocolate brown. The fiber was a gift and my first time spinning Ginny’s wares. It’s a pleasure to spin. Did I mention that I love the colors? I hope to have at least 4 ounces complete by Valentine’s Day. 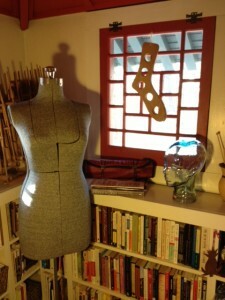 In Episode 23, I mentioned that I did make a purchase at Vogue Knitting Live. 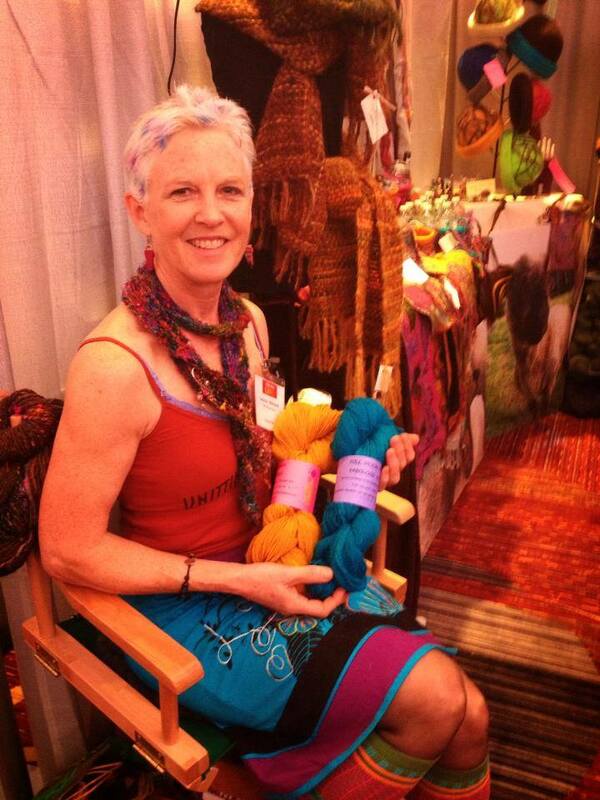 I met the beautiful, engaging Laura Watson at her booth, which was bursting with Full Moon Farm‘s Fabulous Fiber. Since one of my goals for 2014 is to purchase yarn from new-to-me purveyors, and since the farm’s location in nearby Gardiner, NY makes the yarn local, I decided to buy enough yarn for a project I’ve had in my queue for awhile. 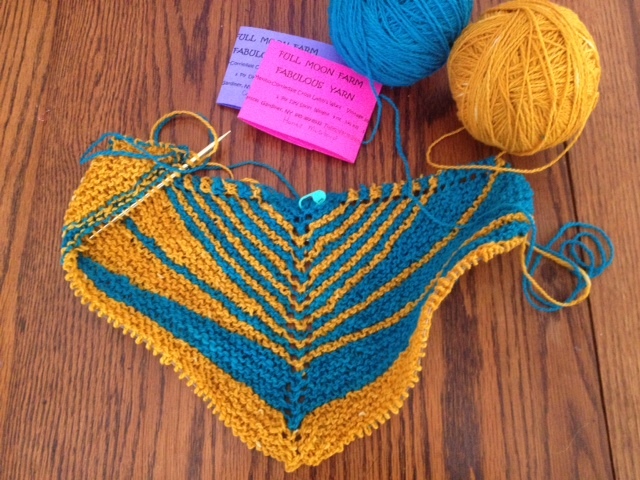 The Aggregate shawl by Jimenez Joseph of JimiKnits is the perfect showcase for the vibrant colors of Laura’s yarn. I’m really enjoying this pattern and the yarn, a 2-ply of Merino-Corriedale cross fiber. 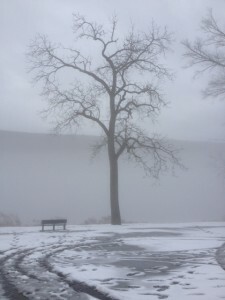 The spotlight on lentils thread on Ravelry will remain open, but on January 31, I will be choosing a winner from among those who have posted to win a pattern of $7 value or less. Next month’s spotlight is on oats. 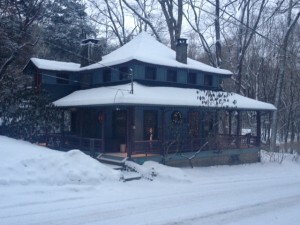 The Ravelry thread for discussion, recipe sharing and photos will open on February 1. This week’s episode features the following segments: A Little Bit of Learning, Ever-Expanding Skill Set, Yarn Lover at Large, The Back Porch, and The Front Porch. One of the things I forgot to mention when I discussed the nutritional properties and cultivation of lentils in the last episode was the tradition of eating lentils at the new year as a symbolic gesture. It is customary in some cultures to eat lentils on New Year’s Eve or New Year’s Day because lentils, resembling tiny coins when they’re cooked, are an auspicious symbol of wealth and prosperity and are said to bring luck. I think that auspicious eating for the entire month of January is in order. For some great recipe ideas and more suggestions of lucky foods for the new year, visit the Whole Foods Market website. If you’re cooking along with the bulk bins cook along, you can enter into the monthly drawing for a pattern prize on Ravelry by posting your comments, recipe ideas, links, and photographs in the Bulk Bins CAL thread. You can also join in the fun by using #bulkbinscal on Twitter. 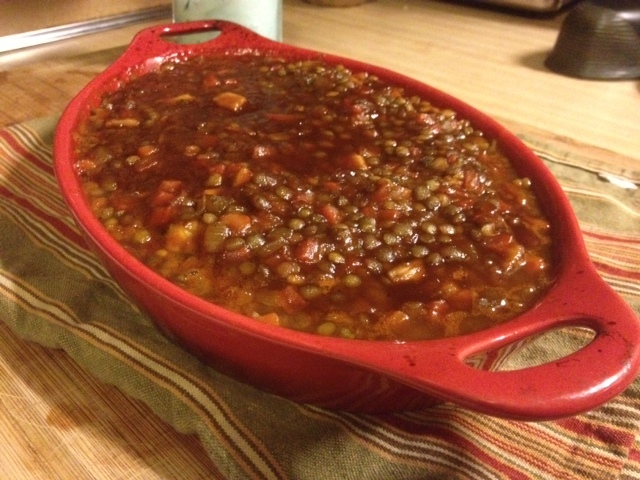 Oh, my, were these barbecue lentils good. I’m talking stick-to-your-ribs, incredibly tasty. I served these over baked potatoes. Yum. I began with a recipe suggested by a listener and adjusted it based on the contents of my pantry and the fact that I don’t have a crock pot. This recipe is adapted from Karen’s crock pot version, with turkey stock and leftover turkey from my Thanksgiving bird. I used my Le Creuset cookware so that I could cook on the stovetop and in the oven using the same pot. Also, I’ve employed two techniques I’ve learned through my research on cooking with lentils: 1) salt slows the cooking process, so it’s best to add salt once lentils have reached the desired level of doneness 2) lentils are easier to digest if you add them to already boiling liquid. In a heavy-bottomed pot over medium-high heat, sauté onions for 3 minutes. Add carrot, celery and garlic, continue to sauté another 3 minutes. Do NOT add salt. Reduce heat to low and cover; “sweat” for 7 minutes. Pour in stock and bring to a full boil before adding lentils. Stir, then reduce heat to low and cover; simmer for 12-15 minutes or until nearly all of the liquid has been absorbed. Stir in remaining ingredients. Pour into a casserole dish and bake in 350 oven until bubbly. I didn’t have any bacon on hand, but if I had, I’d prefer to dice 2-3 slices of bacon and render, using bacon fat to replace oil/butter. Then, I would reserve the crispy bacon and sprinkle on the top before serving. 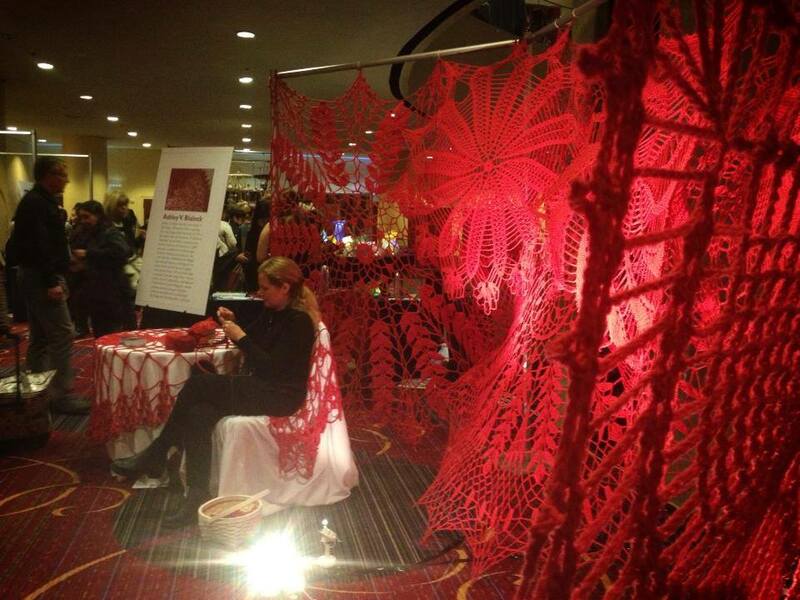 On Saturday, I took the train to NYC to spend a little time at Vogue Knitting Live. Specifically, I wanted to attend a lecture by Clara Parkes, whose memoir, The Yarn Whisperer, I had recently read. I was late to the game in learning about her Great White Bale project, but I wanted to learn more. 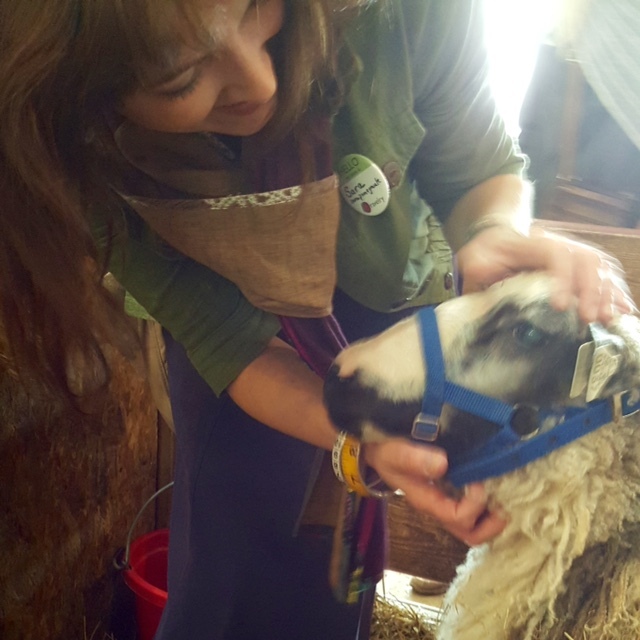 Clara purchased a bale of Saxon-merino fiber (that’s 676 pounds), then set about the task of working with mills and dyers in the US to turn that fiber into yarn for a the enterprising folks who purchased exclusive access to the products and Clara’s story about her journey. During her lecture, Clara showed photographs and video, and discussed the triumphs and the many, many challenges of her journey. 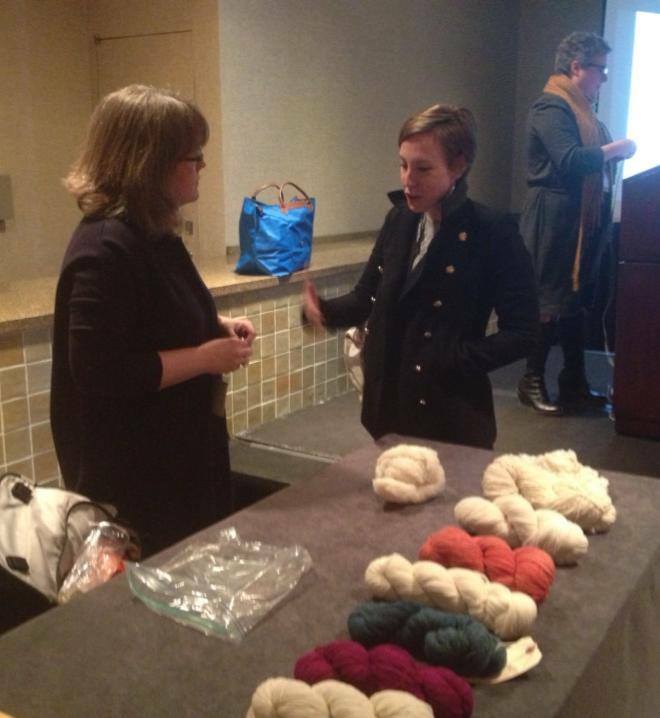 In closing, she implored members of the audience to think carefully about the people, products, and industry practices you are supporting when you purchase each skein. If you’re interested in the state of the US textile industry, you may enjoy “Fruits of the Loom,” an article and photo essay that appeared recently in The New York Times. There were many, many artists with work featured at VKL, and that was one of the highlights for me in visiting the conference. One artist, who was sitting inside a magnificent work titled Keeping up Appearances, was Ashley V. Blalock. This is a stunning and thought-provoking piece that invites conversation about contemporary attitudes towards domestic arts. The structure of the display is reminiscent of doilies — intricate patterns of delicate crochet work. However, delicacy is contradicted by the large scale and bold use of color, which suggest raw emotion, perhaps even violence. It was a pleasure to speak with the artist about her incredibly provocative installation. This week I was given the gift of a lentil-inspired pattern by Andrea Delhey. It’s called Indian Lentils and it’s perfect because I’ve been thinking lately that I need to get back to some crochet projects. I’m using some Noro Taiyo sock yarn for this scarf. The pattern is very easy to memorize and its long, long rows give make it a good one for working on while I’m chatting or watching a podcast. This week’s episode features the following segments: Ever-expanding Skill Set, A Little Bit of Learning, The Back Porch and The Front Porch. 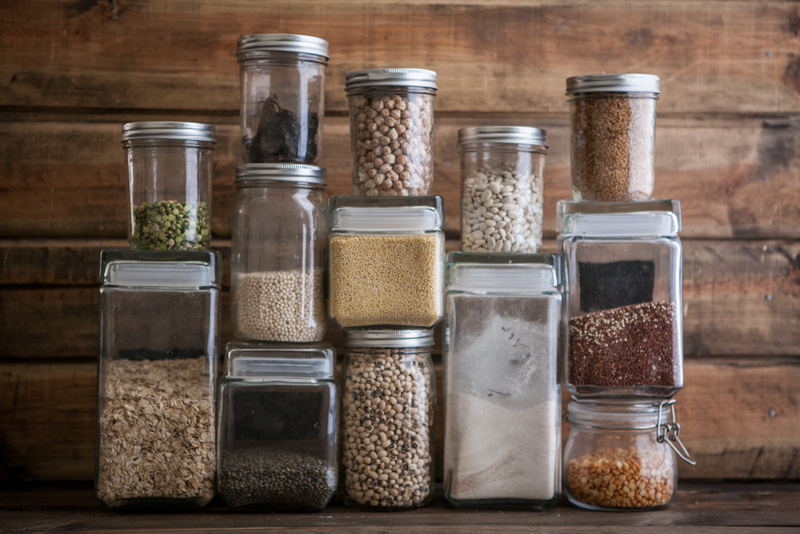 Thank you, everyone, for the enthusiastic comments and posts about the Bulk Bins Cook Along. I’m thrilled that you are as excited about the idea as I am. Contribute your recipes, tips, and photos to the BULK BINS CAL thread on Ravelry. There is already a great conversation and recipe exchange going on in this thread. 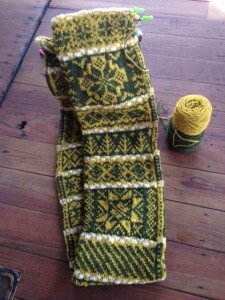 Each month, one post will be selected at random to win a Ravelry pattern valued at $7 or less. After announcing the idea in the last podcast episode, I spent a frigid Sunday afternoon cooking with French lentils for the first time. 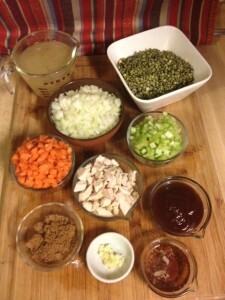 This soup recipe from Carrie Vitt of Deliciously Organic was my inspiration. I used pork kielbasa from Applegate Farms and some frozen turkey stock from my Thanksgiving bird. I also replaced the tomato products with 1/2 cup of finely diced sun-dried tomato. Just before serving, I squeezed the juice from half a lemon into the pot and shaved some parmigiano-reggiano over each bowl. This week, I’m sharing some nutritional facts and culinary lore about lentils on the podcast. I have found excellent information on The World’s Healthiest Foods website. This week, I completed several projects. 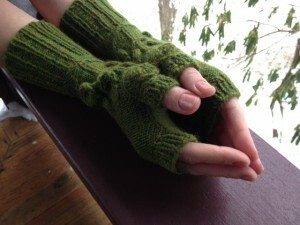 Here you see the Spring Foliage mitts by Alana Dakos. I knit them in Berroco Ultra Alpaca Lite in peat to coordinate with my Batad. These mitts are beautifully patterned and wonderfully stretchy at the cuff. Alana’s patterns are written so well that I end up taking on much greater challenges than I think I am capable. For example, cables. And working with dpns (double-pointed needles). Whatever, the challenge, I feel confident that if I follow Alana’s pattern carefully, I will come out with a beautiful garment. I also completed a fringed scarf (pictured at the top of the post) made entirely of scrap yarn in sport, DK, and worsted weight. Changing yarns every four rows and using linen stitch creates a lot of visual interest in this scarf. What a plus that you don’t have to weave in ends — you simply knot the ends of yarn together as you change colors and leave them hanging for a fun fringe on the side. Ingenious. 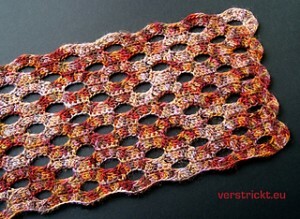 I highly recommend this pattern, called Flickerl, from Simone Eich of WOLLWERK. During the month of January, I’ll be working on some additional hat donations for Click for Babies. I’ve completed three hats so far. I’ve also begun working on my first-ever Amy Herzog pattern. This is my entry in a knitalong for SSK retreat members. That’s right, in July, I’ll be traveling to Nashville for the Super Summer Knitogether sponsored by theknitgirllls. The pattern I chose for the Amy Herzog KAL is the Fellowes cloche. It looks to me like something Lady Edith would wear when she leaves Downton Abbey for a few days in London. I know, I know. Lady Mary gets all the attention, but I really enjoying Lady Edith’s wardrobe — especially in this season of DA. Edith’s character is more fashion-forward and less traditional, so she has some exciting pieces and playful colors in her wardrobe. This pattern is a challenging one, featuring linen stitch and wraps and turns. Happy New Year! This episode includes segments titled The Back Porch, Double Happiness, The Front Porch, and Ever-expanding Skill Set. Listen to the podcast episode for the Little Things contest prize winner. Since spinning the honey to fig gradient from FiberOptic, I’ve been eager to get started on making something with the extraordinary merino-silk that took an age to spin and chain-ply. I did not get enough yardage to knit the Clawed shawl featured in Ply magazine’s COLOR issue, so I decided to knit a Daybreak shawl by Stephen West. This required dividing the yarn into two separate balls. After a lot of number crunching and second-guessing, I made the cut. It turns out that my instincts were pretty good. I was able to keep complementary colors playing against each other throughout, and ended with a border of dark hues. 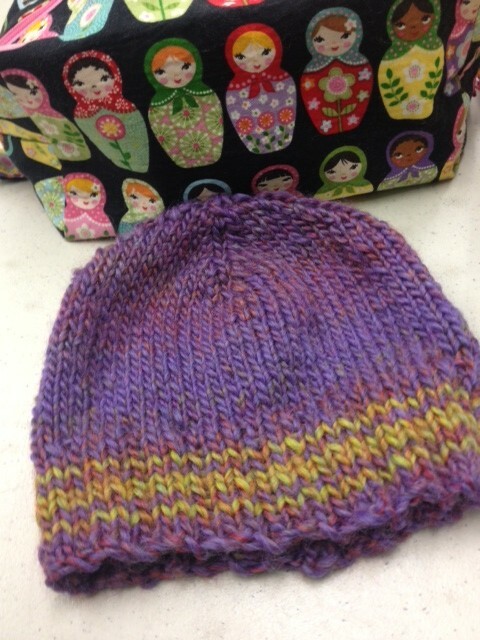 Another completed project is the Bitsy Baby Beanie by Ellen Silva of the Twinset Designs podcast. The pattern is great for beginning knitters and the perfect size and difficulty for charity work. Each January, I try to make several contributions to a charity. This year, I’ve decided to knit hats for the Click for Babies initiative, which seeks to educate parents about the period of “purple” crying and the significance of shaken baby syndrome. Hats for this charity should be in newborn / infant sizes and must be at least 50% purple. I’ve searched through my stash for purple yarn and I intend to knit several hats for the cause. 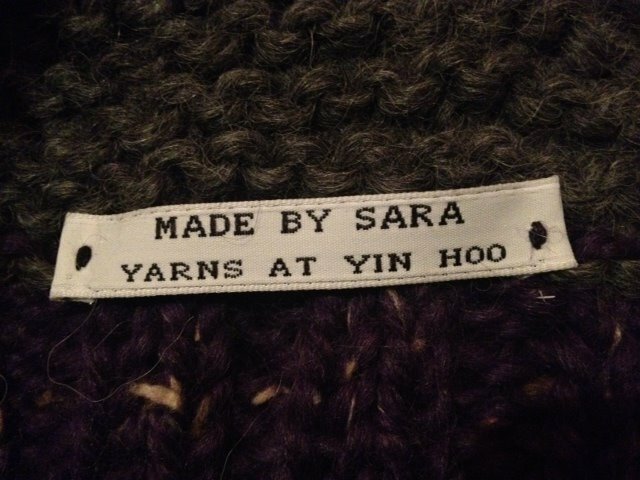 This holiday season, my suspicions about my knit-worthy family were confirmed. Everyone on my gift list received my handiwork with a smile and a thank you. It was fun to knit for them, and even more fun to see them wear the things I made. I’m already planning some projects for gift-giving next year. I’m also delighted by the thoughtful gifts I received–gifts for a knitter! Four of my favorites: a vintage adjustable dress form on a heavy stand (her name is Gertrude); a glass head for modeling hats; The Fleece & Fiber sourcebook; a needle case by Crippenworks, and a set of awesome headphones. After a quick search on Ravelry, I located my list of goals for 2013. 1) Learn to knit socks. 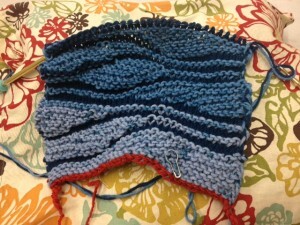 2) Get the basics of changing colors to make stripes in a pattern. 3) Attend the knit nights at my LYS and get to know some local knitters. 5) Continue to drum up interest in the String Theory knit/crochet club I’ve volunteered to advise at the school where I work. 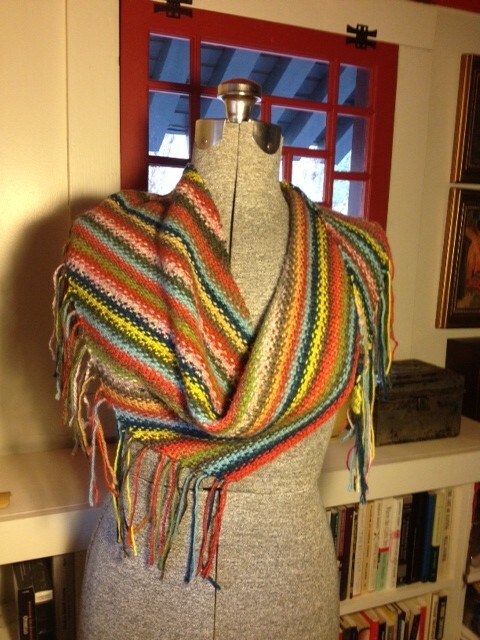 6) Knit something for my husband’s 2013 Xmas. I’m thinking some cashmere yarn and a masculine scarf pattern. This year, in order to expand my culinary skills, I’ve decided to experiment with products from the bulk bins at my local health food store. In the past, I’ve turned to the bins for inexpensive alternatives to packaged items at the supermarket. But there are so many products I’ve never tried. By focusing on one ingredient each month, I can really expand my repertoire of recipes and cooking techniques. I hope you’ll join me for a year-long cook-along. 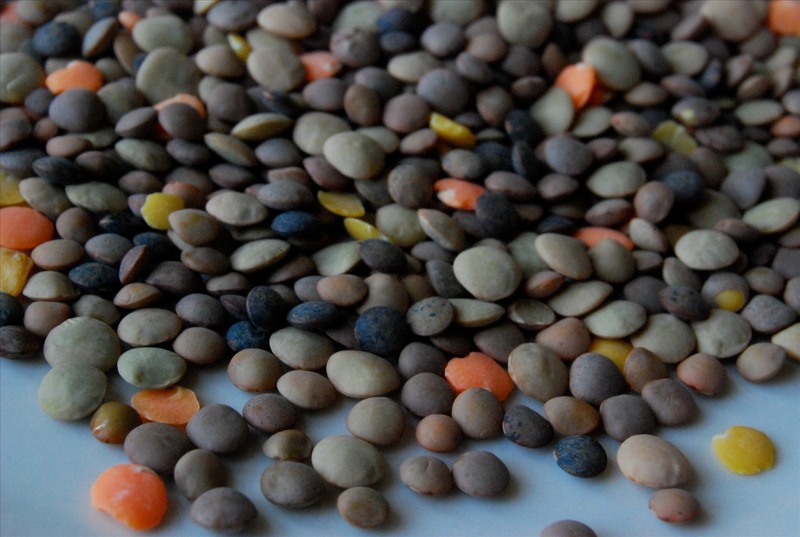 In January, the spotlight will be on lentils. 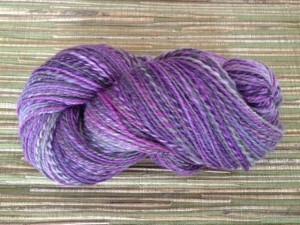 Share recipes, links and photographs of your dishes on the Ravelry thread. The more often you share, the greater your chances of winning a prize in the monthly drawing! Get started with Monastery-style Lentil Soup, found on my friend Kristy’s blog, Creative Wisdom Wellness. This episode includes segments titled: The Back Porch, The Front Porch, Off the Shelf, Ever-expanding Skill Set, and Double Happiness. One of my discoveries this week is the Danish word hyyge (hYOO-guh). Although the rough translation to English is “cozy,” that term does not begin to address the concept of well-being and happiness embraced by Danes, and especially during the holiday season. Cultivating a warm and inviting atmosphere in my home during the holidays is one skill that I continue to improve. Decorating, organizing, building a fire, and cooking up tasty new recipes are just some of the ways I practice the art of hygge during the Christmas season. Soon to be finished is my advent scarf. 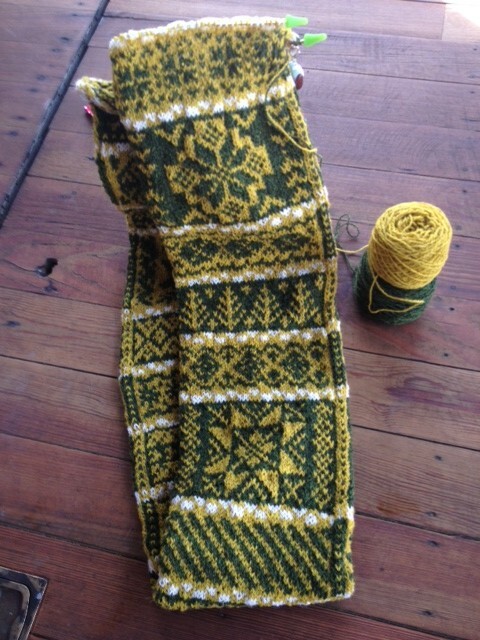 I’ve been working on this scarf since December 1, but haven’t managed to complete the ideal one-chart-per-day. Most of the charts are 15 rows, plus a 3-row divider section. The gorgeous snowflakes are 27 rows, and take several days for me to complete. The other complication is that I’m using a bit more yarn than I anticipated. So, I think I’ll end up with 20 designs in my advent scarf, and I’ll add a ribbed band to each end of the scarf. 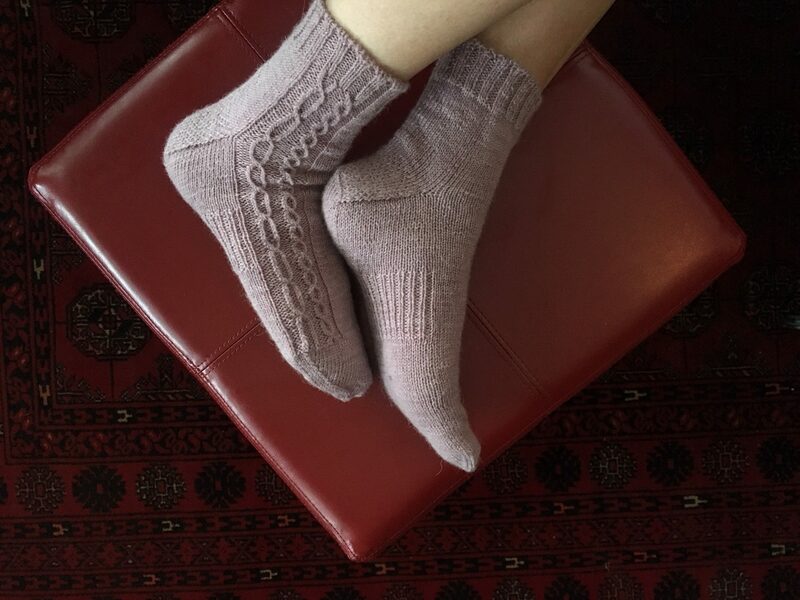 The pattern is by Tricia Weatherston (zemy on Ravelry). This should be finished in time to give to my mother on Christmas day. 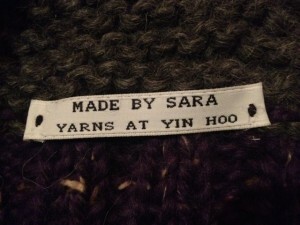 On of my unanticipated purchases at Rhinebeck was a set of 100 sew-on labels from It’s Mine. These arrived shortly before Thanksgiving. I really like the simple styling. Now, I need to sew these onto each of my knitted gifts before giving. Sewing the labels is more time-consuming than I anticipated, but I think I’m getting better with each try. I first enjoyed avocado toast at Cafe Gitane in New York City. Simple and delicious, this toast looks festive enough to serve for Christmas breakfast or brunch. 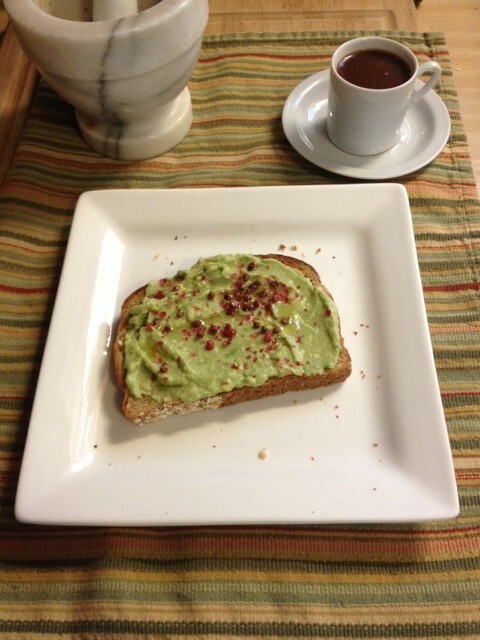 Mash together a ripe avocado, add salt and lemon juice, then spread over a piece of hearty whole-grain bread. Drizzle with a high-quality olive oil and sprinkle with roughly-cracked pink peppercorns. Serve with freshly-brewed espresso and watch the birds flying busily about the feeders on a lazy winter morning. This episode includes the following segments: Ever-expanding Skill Set, A Little Bit of Learning, The Back Porch, The Front Porch, and Off the Shelf. This autumn marked my second making and canning drunken fig jam from my colleague Guy’s luscious white figs. I start with this recipe and alter it according to my tastes. Specifically, I omit the salt, reduce the amount of sugar, replace the lemon rind with orange rind and the cognac with grand marnier. For a luscious product, I let the mixture cook down until it is incredibly dense. To maximize my yield, I can the jam in the smallest jars I can find. The possibilities for using fig jam are as many as your imagination runs wild. My favorite way to enjoy it is water cracker -> goat cheese -> jam. Yum! It is one of the ways to bring the warmth of the summer sun to my Christmas table. 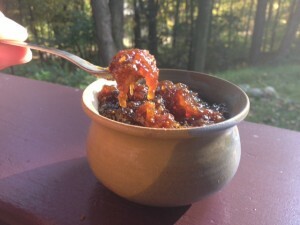 Another way to enjoy dense, fruity jams and chutneys is to use as a glaze for grilled meats. One of the best-known preparations for figs is figgy pudding, popularized by the Christmas carol; however, the boozy pudding has fallen out of favor in England over the years. Dorie Greenspand and Michele Norris attempt to bring it back in this feature from All Things Considered. 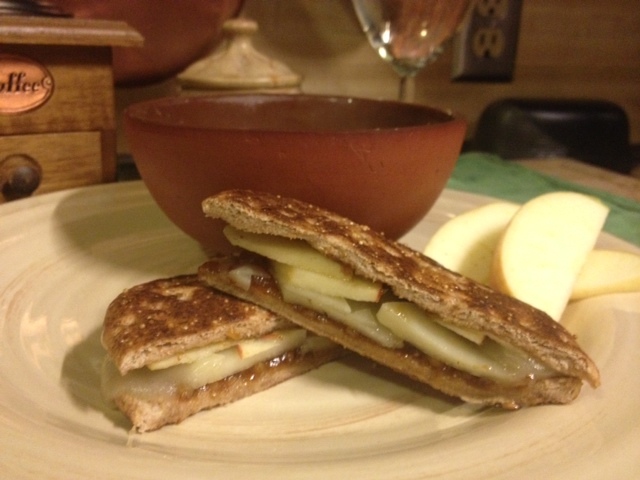 Paired with some tart sliced apple, fig jam elevates a grilled cheese sandwich to an elegant dish. 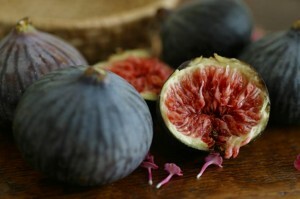 The fig has always impressed me as exotic and enticing. On the rare occasions we had them when I was growing up, my mother served them oven-roasted, just until they became a little runny, and topped them with a dollop of ricotta and a drizzle of honey. Technically not a fruit, the fig is an inverted flower that grows best in Mediterranean climates. Since it requires less water than many other crops, and is most often shipped dried, the fig is often touted as one of the more sustainable and sensible crops of California. The US is #3 in the world in the production of dried figs, and the majority of those are grown in California. Much of the research included in this episode comes from the website of the California Fig Advisory Board. 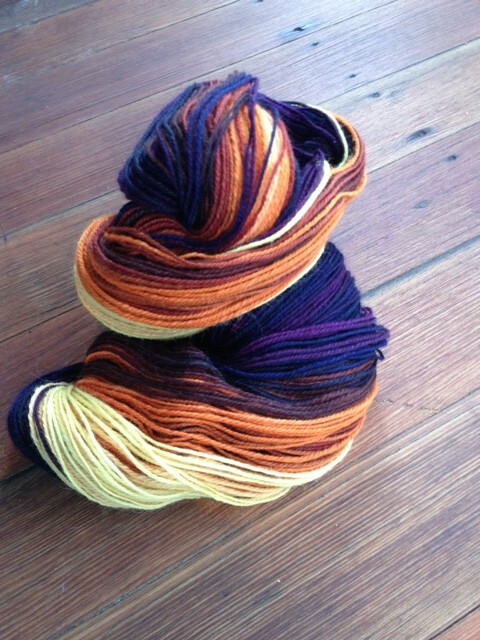 Since purchasing the Honey to Fig Gradient from FiberOptic at Rhinebeck, I’ve been working on this spinning project. The four ounce braid of 80 percent merino / 20 percent silk spun so thin that it has taken me a very long time to complete the spinning and to chain-ply it to preserve the color transitions. I couldn’t be more pleased with the finished yarn — 433 yards of silky soft yarn, from pale yellow through orange and burnt red to a deep and sparkly plum color. There are two potential projects I have in mind for this yarn, both by Stephen West. 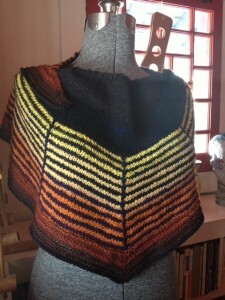 One is the small version of the Daybreak Shawl; the other is the Clawed Shawl, featured in the color issue of Ply magazine. 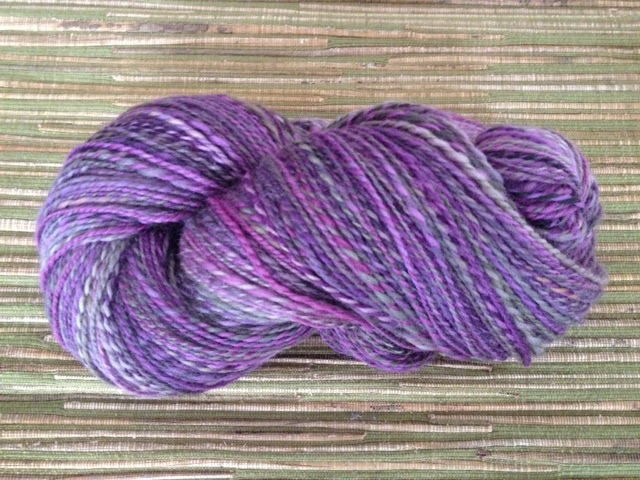 Next on my wheel will be Sour Fig, four ounces of Falkland from Beesybee Fibers. 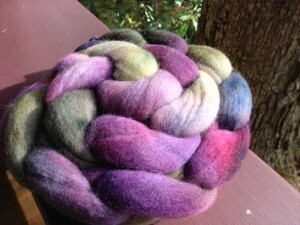 The colors of this fiber are closer to the white figs I used to make the jam. My technique for spinning this will be to divide the braid and spin onto two bobbins, working to get as much barber poling as possible. This might work well for another Batad, or an as-yet-unimagined project. Low temperatures, nasty weather, less sunlight, holiday stress … December can be tough on us. Let’s look to the little things as a way to keep smiles on our faces. This giveaway is generously sponsored by Spinner’s End Farm. 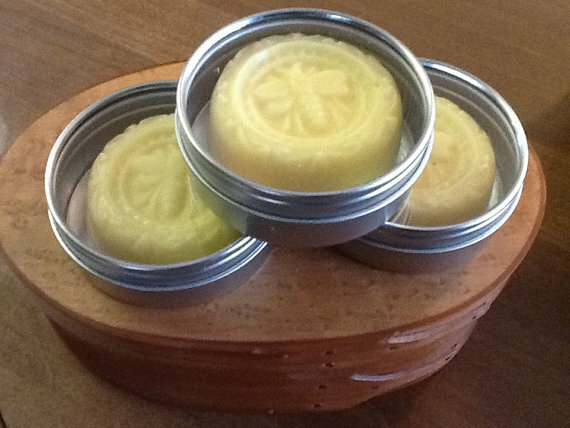 Sherry will put together a little collection of goodies to pamper and nourish your skin: goat’s milk soap, lotion bars, lip balm — a selection of handmade products to delight your senses and calm your holiday-wearied nerves. To enter, post a reply to the contest thread by January 4th. One winner will be randomly selected from the contest entries. If you can’t wait to find out whether or not you’re the winner, head on over to the Etsy shop and pick out your stocking stuffers now! I consulted several sources for this episode.